This dinghy was built by F.C. Morgan Giles at Hammersmith in 1908. It is of clinker construction with spruce planks on steamed oak frames. It is gunter rigged with a single wooden bamboo mast and spars and a cast iron centreplate and copper buoyancy tanks. It is from this design that and other similar types that the International 14 and National 12 were developed during the 1920s and 1930s. Designed originally with a totally open hull, a half deck was added at some point before 1936 when she was purchased by the Palmer family. Subsequently sold by the Palmer family, a later owner removed the decking to restore her to her original condition (as seen in the image). The Palmers then repurchased her in the 1960s in this restored guise, in which state they reported that without the decking she flexed alarmingly. 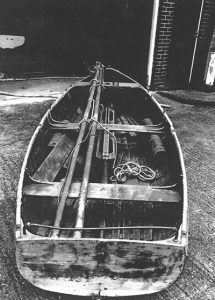 The boat was donated the boat to the Museum in 1978 by the Palmer family.